Boston Public Library hosts Concerts in the Courtyard every summer with free one hour concerts in the courtyard of the Boston Public Library in Copley Square starting Friday, June 2, 2017 until August. The free concert series takes place every Wednesday at 6pm and every Friday at 12:30pm for one hour with a variety of free music from jazz, folk, classical, and more. Concerts are moved from the Courtyard to Rabb Hall in the event of inclement weather. For more information or to view the Concerts in the Courtyard schedule, please head here. 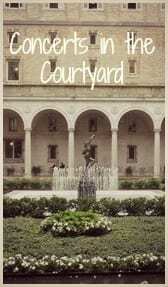 Have you been to Concerts in the Courtyard at the BPL before?